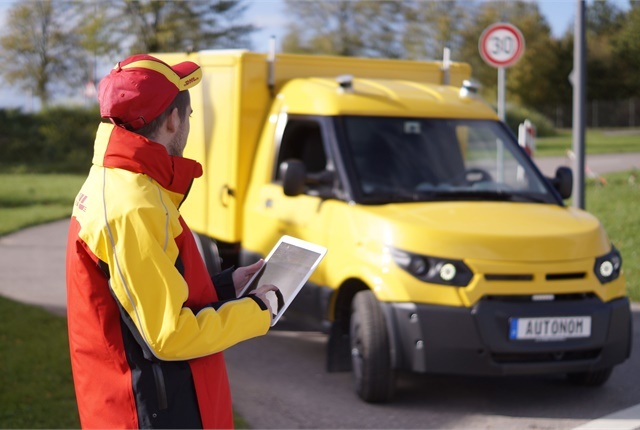 Automotive component supplier ZF and the Deutsche Post DHL Group (DPDHL) have announced the companies will work together to deploy a test fleet of autonomous delivery trucks beginning next year. A prototype delivery vehicle, equipped with six cameras, one radar system and LIDAR systems, was unveiled to coincide with the announcement. According to details released by ZF, DHL, one of the world’s largest mail delivery and logistics companies, will outfit a fleet of electric light trucks using ZF’s ProAl autonomous driving technology for package transportation and delivery, including last-mile applications. ProAI is based on NVIDIA Drive PX automated driving technology. DPDHL currently operates a fleet of 3,400 StreetScooter electric delivery vehicles that can be equipped with ZF’s autonomous driving sensors, which include cameras, lidar and radar. These sensors feed critical information on a vehicle’s environment into the ProAI system, which then analyses the data to plan a safe path forward or even park itself. ZF said the system allows parcel delivery companies like DHL to deliver goods with greater accuracy and safety at lower costs. In preparation for next year’s autonomous van deployment, DPHL has already configured its central data center with the NVDIA DGX-1 AI supercomputer, which will run deep-learning models on the trucks’ NVIDIA Drive PX platform. “In its StreetScooter fleet, Deutsche Post DHL is taking its next step with our current and future generation of surround sensor technology and ZF ProAI artificial intelligence brain powered by NVIDIA,” said Stefan Sommer, CEO of ZF.